Located approximately one hour from Washington, D.C., and Baltimore, Frederick County, Maryland, is the perfect combination of hip and historic. Wineries and breweries dot the countryside, celebrating the region’s rich agricultural history. Scenic byways traverse natural areas and parklands, filled with recreational opportunities. 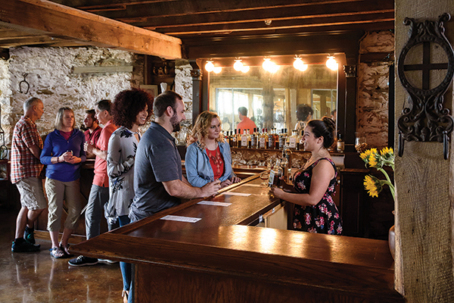 After driving through historic wooden covered bridges on a self-guided tour or hitting the trail in a nearby national or state park, it’s easy to relax in the tranquil countryside and drink in the view. 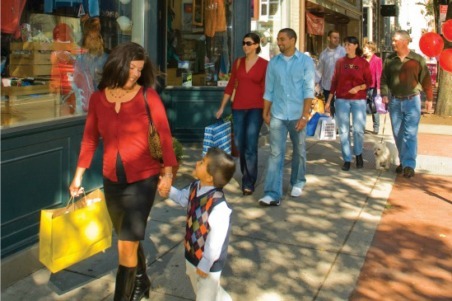 Fill another day with shopping at independently-owned boutiques in historic Downtown Frederick. Here’s a guide to help you create the perfect weekend getaway filled with wine, craft beer and shopping in hip and historic Frederick County. Weekends are a great time to visit wineries in Frederick County. The only difficult part is choosing which one to visit first! Linganore Winecellars is the county’s oldest winery. The family-owned winery was planted at an old dairy farm and now produces 30 wines. More recently, Red Shedman Farm Brewery opened on the property, offering a 12-tap rotation of craft beers, barrel aged beers and hard ciders. Most weekends you can enjoy live music and there are numerous festivals held throughout the year. Be sure to check out Friday Nights at Linganore and Sundays on the Patio. Catoctin Breeze Vineyard in northern Frederick County also offers live music nearly every weekend. The boutique vineyard produces a range of varietal and blended wines, as well as a selection of honey wines, known as mead. You’ll find several Sip & Paint nights among the list of upcoming events at the vineyard. Just a short distance away is Springfield Manor Winery and Distillery. 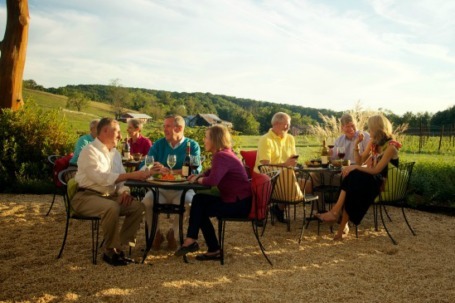 The estate offers breathtaking views of the Catoctin Mountains and appeals to those who love wine and craft spirits. There are fragrant lavender fields on the property where you can gather your own bunches in season. Visit the winery’s online event calendar to see when live music is offered and be sure to check out their Friday night dinner pairings with live music. The vineyard has a brand new tasting room with a 35-foot bar. “We wanted to make sure we could handle how busy we would be,” Kennedy says. By August the winery anticipates offering half a dozen grape wines and about 20 meads. If you’d prefer to sit back and let someone else do the driving while you relax in style, sign up for a wine tour with A Touch of Class Limousines. You can select an existing itinerary or customize one of your own. Limos arrive stocked with water, ice, champagne flutes and rock glasses, too. In early June, the Frederick Wine Festival provides another ‘snapshot’ of the wine scene. Featuring innovative Maryland wines and signature dishes from talented local chefs, the inaugural event takes place along Carroll Creek Linear Park. Live music will be performed at the festival and local artisans will have handcrafted wares available for purchase. If you love beer, you’re sure to love the growing brewery scene in Frederick County. You’ll find a wide range of offerings, from small farm breweries to Maryland’s largest brewery — Flying Dog Brewery. Considered one of the fastest-growing regional craft breweries in the mid-Atlantic, Flying Dog Brewery offers brewery tours and tastings that are better described as an “experience” with up to 20 beers on tap at any given time. Nearby Monocacy Brewing Company offers tours every Saturday where you can see how the beer is produced in the old Ebert’s Ice Cream plant in historic Downtown Frederick. Beer for Brewer’s Alley, Frederick County’s original brewpub, is also made at the brewery. The tasting room offers sampling, full pours of draught beer, and growler fills. Newly-opened Smoketown Brewing Station offers a unique atmosphere in the small railroad town of Brunswick. The brewery and tasting room are located in a repurposed 1948 fire station where you can enjoy five beers. 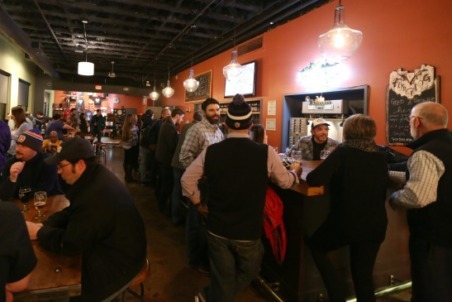 Smoketown Brewing Station is open seven days a week for samples, full pints, or growlers to go. If outdoor recreation and craft beer sound like a winning combination to you, River & Trail Outfitters offers boat and brew tours throughout the warm weather months. The tour combines paddling on the Monocacy River with a tour and tasting at a local brewery. Visit River & Trail’s website for upcoming tour dates. Shopping enthusiasts appreciate historic Downtown Frederick’s more than 200 specialty boutiques, art galleries and restaurants. You’ll find unique offerings from local artisans, clothing and jewelry boutiques, antiques and vintage treasure shops, an independent book store, and more. There are also plenty of shops to tempt your tastebuds, whether you’re shopping for tea, olive oil and vinegar, soda pop, candy, or chocolate. Also in Downtown Frederick, Vini Culture Wine Bar & Cafe has self-serve, state-of-the-art dispensers that offer a diverse selection of red, white, and reserve wines from both large and small vineyards around the world. Purchase a taste, a half glass or a full glass, or have a beer paired with snacks or desserts. A selection of local wines is also available. 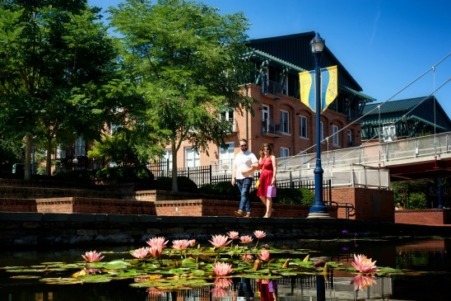 While you’re in Frederick, enjoy a stroll along Carroll Creek, which runs 1.3 miles through the heart of Downtown Frederick. The creek has beautiful water features, bridges, public art, and water lilies in season. Downtown Frederick is the perfect place to stop for lunch or dinner and refuel so you can get back to shopping! The wide variety of dining options will leave you anything but hungry! Downtown Frederick Partnership, Frederick’s Main Street organization, maintains a listing of shopping and dining establishments available in Downtown Frederick. The organization also organizes specially-themed First Saturdays each month with extended hours and specials. If you’re a wine or beer lover and you love to shop—Frederick County has you covered. Plan your visit at www.visitfrederick.org.